A random collection of articles on the history of Sydenham and Forest Hill, in SE London. On the afternoon of Thursday 18th August 1853 over a thousand mourners gathered in the nave of the partially completed Crystal Palace, on Sydenham Hill. As the clock struck three a procession formed and began the journey down Westwood Hill (then West Hill) to St Bartholomew's Church, described in one account of the funeral as "an elegant modern structure, embosomed in luxuriant foliage, and situated in a most romantic spot". Others joined the procession as it made its way down Westwood Hill. By the time it reached the church there were, according to one estimate, between two and three thousand mourners. They were paying their last respects to eight men who, with four others, had died while working on the construction of the new Crystal Palace. The men were killed when scaffolding upon which they were working collapsed. Their funeral was conducted "in a very impressive manner" by the incumbent of St Bartholomew's, the Reverend Charles English. Nearly two years earlier, in October 1851, the "Great Exhibition of the Works of Industry of all Nations" had closed. The exhibition had been held in a wonderful building in Hyde Park, designed by Sir Joseph Paxton and dubbed by Punch "the Crystal Palace". The building was due for demolition and a new site was desperately sought. Eventually a perfect spot was found, on the summit of Sydenham Hill. The erection of a much larger Crystal Palace began on 5th August 1852. The rebuilding progressed speedily and within a year much of the structure was in place. By August 1853 work was starting on the arched roof of the great central transept, to become perhaps the most easily recognisable feature of the completed building. This transept, which crossed the central part of the main building, was 384 feet long by 120 feet wide and 208 feet high and had to be spanned by a great arched roof. The builders had to construct a series of temporary trusses to support the arches over which the glazed roof would be built. The trusses were made in situ, 170 feet above the ground, on scaffolding that was supported not on the ground but on already constructed galleries around the central transept. At about 2 p.m. on Monday 15th August 1853 Mr Chamberlain, a medical man, was walking down Anerley Hill. He heard a sharp noise "like the falling of a plank". He then heard "a loud crack" and saw a large part of the scaffolding in the central transept give way. There was "a great cry followed by a tremendous crash" and he saw (in an unfortunate but graphic phrase) "workmen dropping like partridges". 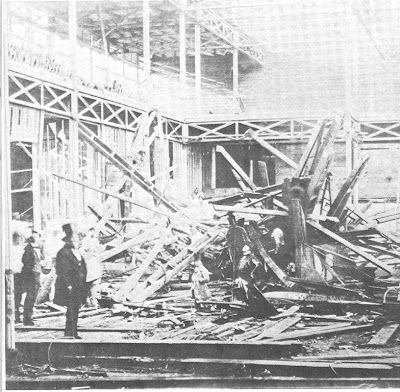 Mr Chamberlain hurried to the central transept where he saw, amongst the debris of the fallen scaffolding, "sixteen or seventeen workmen, dead and dying". In fact, twelve men died, five were injured and one, amazingly, survived quite unhurt. The precise cause of the accident was never determined, and the coroner's inquest was unable to apportion blame. However Messers Fox & Henderson, the building contractors, decided that future scaffolding would be built from the ground rather than from the galleries. The Times reported that the accident was: "...an example of the risks to which the working classes are exposed in the course of their employment... The character of the building in which the accident occurred and the favour in which it is regarded by the public insure for this melancholy event an unusual degree of sympathy. These men have perished while engaged upon the construction of a building unparalleled for its magnitude, for the originality of everything connected with it, for its social objects, and for the manner in which it is to be carried out... How little will these [men] be remembered bye and bye when the people are in full enjoyment of their Palace and everything but its transcendent splendour is forgotten". But these men are remembered, and the Crystal Palace itself has gone. Ten of the dead share a grave, 16 feet deep, in St Bartholomew's churchyard. Their grave is marked by a large flat stone surrounded by a low railing to the right of the middle path, from Westwood Hill to the south porch. It is shaded by a yew tree. Although the inscription is now barely legible those buried in this grave were: James Wardlow, Joseph Copping, George Rolph Smith, George Topham, William Hardy, John Foreman, William James, Henry Fielding, Henry Reading and William Harris. The last two died in Guy's Hospital and were buried in the grave on the following day, 19th August 1853. An architectural adviser from English Heritage recently visited the monument, and reported on its condition, giving advice on repair and preservation. It is hoped that resources will become available at least to prevent further deterioration and, perhaps, to restore the monument. 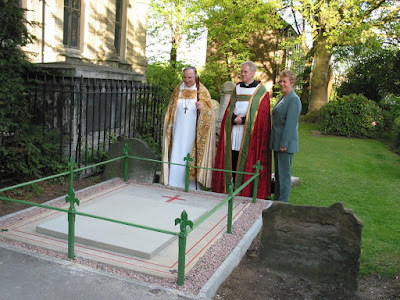 Footnote: this article was first published in 2000; the grave was restored and rededicated in 2003. I am a descendent of George Topham.who died on Crystal Palace. His daughter,despite all the disadvantages of seeing her father die and her mother having to move to Deptford,a hell hole in mid 1800's. She rose to become a school mistress at Wyck Rissington,and played the Organ that was later used by Gustav Holst in Wyck. This blog consists mainly of articles on the local and social history of Sydenham and Forest Hill, many of which first appeared in the Sydenham Society newsletter.